Caption : Kochi,02/05/10. At Kumbalangi Integrated Tourism Village, one can fully enjoy a variety of natural splendor. Kumbalangi was the first model tourism village in the country. Located in the outskirts of the port city of Kochi in Kerala, this model village is a veritable treat to its visitors with the famed Chinese fishing nets, gorgeous view of the backwaters, and immense fishing and boating opportunities. 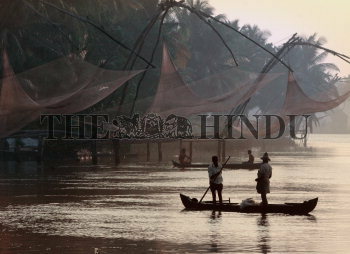 A picteresque scene of the Chinese nets set against the rising sun. Photo: H.Vibhu.